Babington's Leek (Allium ampeloprasum var. babingtonii) is an extremely rare perennial leek that is unlike any other leek I have ever seen or heard of. 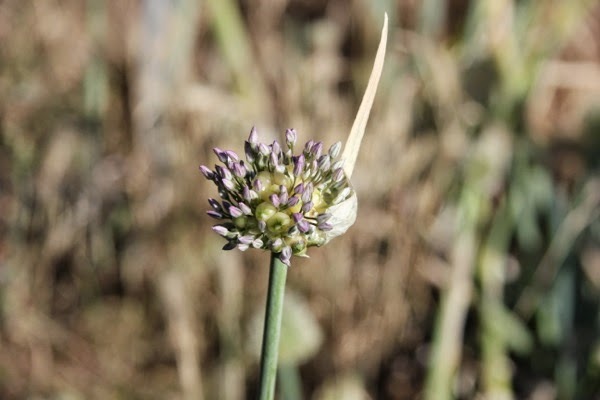 When this leek flowers it generally does not produce seed, instead it grows tiny leek bulbs on the flower head, kind of like the leek version of tree onions. This topsetting habit makes it unique among leeks and makes it interesting to grow and draws attention to itself from everyone who sees it. Babington's leek is rare in the world, so rare that it is almost extinct. 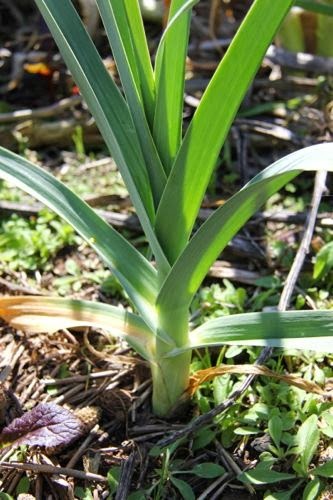 It is one of the rarest edible leeks that are in Australia. Very few people grow them and almost no one has heard of them. There is little information on the internet about Babington's leek and much of what I did read seems to contradict each other. Most of what I have read was either written in the old days, or (like most gardening books) was written by someone who has never grown or even seen a Babington's leek. I find that kind of frustrating and would prefer to get information that has been obtained by personal experience or just go and work it out myself. The person who I got these leeks from had not grown them for long so did not know much about them either. It grows wild in Ireland, England and a few other little countries over there and is only semi-domestcated. Like so many other alliums the origins of this plant have been lost in history. Perhaps it was deliberately bred by some dedicated people, perhaps it happened on a roadside from spilled seed with just the right combination of genetics, perhaps it happened in the wild away from people completely and was discovered by chance. Many people theorise that the Babington's leek is a relic from some ancient monastery, unfortunately we will never know for sure. What we do know is that it has been around for a long time and there is not much of it anymore. Babington's leek, much like any other allium, benefits from moisture and nutrients early in the season, the more the better. That being said it can perform remarkably well in rocky or sandy soil and with minimal soil moisture, this productivity under harsh conditions is one of the benefits of being a semi-domesticated perennial vegetable. From what I am told it does not cope with poorly drained soils, my garden does not suffer from this so I do not know about this from observation. Just like any other perennial leek, the Babington's leek tends to be dormant over summer and will die down to odd little bulbs. I assume that in more mild climates and with more soil moisture that the Babington's leek could be convinced to grow through summer, but I am yet to try this myself. I know that the perennial leeks I grow can be kept growing all year if provided with adequate soil moisture. People in countries where Babington's leek are more common often eat the bulbils, they say that the bulbils taste like garlic. They also eat the young flower scape in a similar way to garlic scapes and say that they taste similar. I have never tried either of them and doubt I will get a chance any time soon as I am trying to increase the numbers of this rare plant. I love the taste of leek, it is a very underrated vegetable in my opinion. Babington's leek tastes much like every other leek. I have eaten a few varieties of leek over the past few years and to be honest can not tell the difference between them. I have read that Babington's leek may be more fibrous but from my limited experience this is not the case. Over summer it will die down to bulbs, I am told that these bulbs taste much like garlic. I have not tried them yet as I am trying to increase my stock but it does stand to reason as Giant Russian Garlic is another variety of perennial leek. Babington's leek is extremely rare, in Australia it is almost unheard of. For this reason, if you grow them, please do not kill the plants when you harvest the leeks. Like every other variety of leek, you can harvest by cutting them off and leaving the roots in the soil to regrow. Another method is to pull up the plant, cut off the roots with a few mm of shank attacked and put this in a jar with a tiny amount of water to sprout. They only need a tiny amount of water, just touching the roots is enough, too much water will cause the whole thing to rot. After this has sprouted it can be replanted into the garden to grow. In this way you can have your leek and eat it too. Your stock of Babington's leek can be increased in a few ways. By not killing the plants when you harvest them stops you from losing plants but does not stop you from eating them. This does not increase the number of plants you have and usually prevents the plant from flowering that year, but it does stop you from having any less which is a good first step with something as rare as these. The plant will die down to a bulb each summer, many times this bulb will divide in a similar way to garlic (but into less cloves) and can be dug up, split apart and replanted. This is a slow and steady way to increase your stock. Quite often this will result in a few extra large plants, most of which will flower the following season. The larger plants will send up a flower stalk each year. This flower stalk will produce some flowers as well as some bulbils. Please do not remove the flower stalk, it is kind of the whole point behind growing Babington's leek. While removing the flower head may result in larger underground bulb or a larger leek plant you could simply grow regular perennial leeks if this is what you are after. When it is ready the bulbils may fall off the plant and start to grow all by themselves, but a better way is to remove them and plant them somewhere safe. Every bulbil should sprout and grow for you, if left to their own devices anything could happen and the bulbils may be lost. 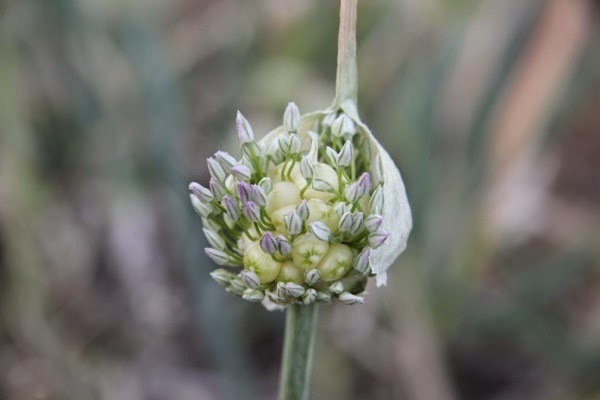 It may take 2 or 3 years for these bulbils to send up flower stalks of their own, or if you treat them well they may flower in their first year, but once you have a flowering sized Babington's leek plant it will provide you with many bulbils each year. I am lead to believe that each year the number of bulbils increases significantly. It would not be difficult to have a small patch of Babington's leek where one plant is left to produce bulbils each year and the rest are harvested and eaten. It may be possible to obtain some seed from Babington's leek, in order to do this you would probably have to remove most/all of the bulbils so that the plant can put energy into the seeds rather than the bulbils. I have not yet done this as I wanted the bulbils, but when I do I will grow the seeds and if anything remarkable comes of them I will try to distribute them. I assume that seed grown plants will display a lot of variation, some will invariably be less exciting than the parent stock, but there is a chance that something remarkable may come out as well. We need people to breed these things and enrich our country with them. I sell Babington's leek bulbils and small plants on my for sale page as soon as they are ready. Before you buy them please read about how to grow Babington's leek. I have a range of other perennial vegetables, some herbs, some heirloom vegetable seeds, and a few other things listed on that page too. Unfortunately I can not rush the Babington's leek, when they are ready they are ready and when I sell out then I have to wait until the following summer for more to grow. Bulbils should be ready in Summer but they will not start to grow until Autumn/Winter.